PORT ANGELES – The Peninsula Pirates, who this week moved up to No. 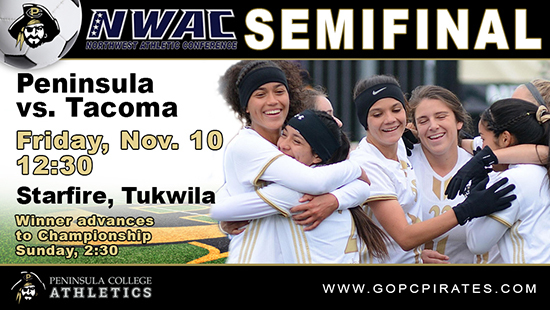 4 in the national junior college women’s soccer rankings, will get an 8:25 a.m. Thursday sendoff at the College where they will travel to Tukwila to train at the Starfire Sports Complex in preparation for Friday’s 12:30 Northwest Athletic Conference semifinal match against Tacoma. This year marks the seventh straight league championship for the Pirates and the seventh straight trip to the NWAC Final Four. The defending NWAC champions and top-ranked team in the conference is not taking Tacoma lightly, however, despite a 9-0 win over the Titans back on Aug. 29. The Pirates, who finished 15-0 in league play and 19-0 overall this year, are riding a 37-match winning streak that dates back to a Sept. 9, 2016 tie with Spokane. It’s the longest junior college win streak in the country. Tacoma, meanwhile, played in the shadow of second-ranked Highline in the West Region all season, finishing second with a 10-2-2 record, 15-5-2 overall. The sixth-ranked Titans then shut out Clackamas 1-0 in the first round of the NWAC playoffs before upsetting Walla Walla 3-2 in the quarterfinals. The Warriors were the East Region champions and tied with Highline for the No. 2 ranking in the NWAC. His Pirates had a rather easy go of the North Region, winning all 15 matches and outscoring opponents 119-5, but they got a good test from Lane in the quarterfinals, passing that test with a 3-0 victory. The NWAC semifinals has Peninsula squaring off against Tacoma at 12:30 Friday at the Starfire Sports Complex, followed by Highline vs. Clark at 3 p.m. The winners advance to play in Sunday’s 2:30 NWAC Championship, also at Starfire. The All-Star members of the teams that fall in the semifinals will participate in the NWAC All-Star Game at 9:30 a.m. Sunday. The Pirates are led by North Region MVP Sydney Warren, who continues to re-write the single-season scoring record at Peninsula, currently at 30 goals. That mark leads the NWAC. Also putting up good numbers this season offensively are Taylor Graham, who has 14 goals off the bench for the Pirates, Janis Martinez-Ortiz with 13, Maddy Parton with 13, Kelly Kevershan with 11, Jayna Morikowa with 11 and Shantel Torres-Benito with nine. The Pirates also have the NWAC’s top assist leader in sophomore Jordyn DiCintio with 28. Kevershan has 10, Martinez-Ortiz has 10, Parton nine, and Briana Duran, Graham, Sarah Reiber and Warren have seven each. Defensively, Peninsula is led by goal keeper Akari Hoshino, who has seven shutouts and who has allowed only seven goals in 16 matches. And although there aren’t stats to support them, Peninsula’s back line, led by Samantha Guzman, Emelie Small, Malia Brudvik, and Halle Watson have been very strong. Tacoma’s Isabelle Creighton is right behind Warren among NWAC scoring leaders with 24 goals, and teammate Haleigh Thompson has 11. Tacoma’s assist leader is Jolene Kvinsland with eight, Thompson has eight and Kayley Cruz has five. As a team, the Pirates lead the NWAC with 138 goals, which has already smashed the NWAC women’s soccer team scoring record set by Walla Walla back in 2007. The Pirates have given up nine goals. Tacoma found the net 64 times this season and has surrendered 33 goals. Peninsula this week climbed into a tie for No. 4 in the United Soccer Coaches National Division I Junior College Coaches’ Poll. That equals the highest ranking in the program’s eight-year history. The Pirates also reached No. 4 in 2014. The NWAC poll has had Peninsula at No. 1 all season. Fans going to Starfire this weekend will pay $5 for parking and a one-day adult pass is $15.